This one just came in recently from France! It’s a super pretty Vintage Botanical Floral Print! I’ve created a Printable so that you can, print it out and frame it right up for some Instant Art! I’m not sure what kind of Flowers these are, they are very interesting looking. I love the bright colors and the sort of stripey looking Petals on these! The wispy looking branches are a nice touch too. I hope you like it too! 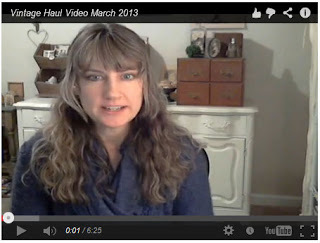 In Other News: I’ve created another Vintage Haul Video with some of my March Paper Finds! Once again I’m doing a preview of what’s to come on my blog. (The floral print above is on the video as well.) You can watch the Video HERE. How strange! I’m unable to click the “Here” button for the printable without blogger telling me I don’t have the proper permission. Did I miss something about having to sign up somewhere? What a pretty image! Have you changed the manner with which you will be sharing images with us? I had the same problem as the ones that replied above. It looks like none of us are able to get the image 🙁 Karen, please check and let us know. Thanks so much for all you do! Just another one …that cannot get into the download. I can’t get to this beautiful image..Why is google blogger coming up? Yikes! Thanks everyone for letting me know! I was gone all day today, and had my blog posts on auto pilot! Anyway, I’ve fixed the PDF link so you can click on it, and grab it now. Thank you Karen and everyone I thought it was just me. Got it now and just love it!!! Yay! So excited that it works now! Can’t thank you enough for your sharing all your beautiful finds!!! I want to frame this for my 12 year olds new, big-kid, “shabby chic” bedroom!! Flower 1 says renoncule – so it’s a type of ranunculus flower. I can’t quite make out the name of flower 2 though.